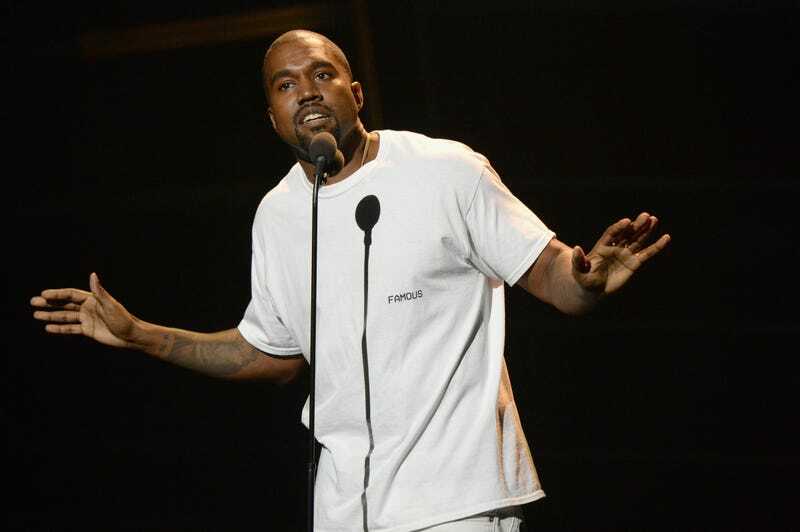 Kanye West is equally as well-known for his Grammy award-winning music as for his opinions and (occasionally inflammatory) outbursts. Over the last few weeks, we’ve seen a lot of headlines on the latter. On November 21, a series of increasingly strange behaviors from the rapper culminated in the most un-Yeezy-like of them all: canceling the remaining dates of his Saint Pablo Tour. That same day, Kanye was admitted to the UCLA Medical Center to undergo psychiatric evaluation. His physician said Kanye was experiencing “temporary psychosis due to sleep deprivation and dehydration.” Last night, November 30, sources reported that Kanye was released from the hospital and returned home to his wife Kim Kardashian West and children. So far, Kanye hasn’t publicly shared any details about how he’s feeling, or what took place during his stay in the hospital. If his fans are curious, they won’t get any clues out of Kim, either; once something of a Snapchat starlet, the mother of two has taken a break from social media after she was robbed at gunpoint nearly two months ago. Kim’s family’s reality TV show, Keeping Up With The Kardashian, where Kanye occasionally pops up, has stopped filming. It is safe to say we don’t know what is going on with Kanye. There has been no official statement from the rapper, his publicity team, or his record label about why he sought out treatment, and why now. No one can know what is going on with Kanye, really—except Kanye, and maybe Kim, and whoever else the rapper chooses to open up to. But there are things we can learn about the complicated relationships between celebrity, race, mental health, and stigma that might help us better understand Kanye’s experience. Dr. Joseph S. Reynoso, clinical psychologist and faculty at the Metropolitan Institute for Training in Psychoanalytic Psychotherapy, has studied celebrities and the public’s perceptions of them—and we spoke to him on the pressures that come with being in the spotlight, especially for black males. TrackRecord: Is there something about celebrity that is inherently mentally destabilizing and fragmenting? Dr. Joseph S. Reynoso: My main area of interest is professional athletes. Recently, I gave a paper on Tiger Woods on how the American public related to him and how, in some ways, that potentially contributed to some of his difficulties. To answer your question: becoming a celebrity, particularly for professional athletes, happens when they’re very young. I think this does create certain ways in which your personality can become a little restricted. There’s intense attention given to you, there are intense ways in which you may feel other people are admiring you, and there’s a one-dimensionality to that becomes a major issue. The celebrity only feels valuable in one or two very specific ways, and it’s possible that they end up, either consciously or unconsciously, feeling very limited by that in the future. TR: That’s interesting that you said a one-dimensionality. Would say that public perception of you as an artist or a public figure directly affects your feelings of self-worth and self-esteem? That creates a very closed system for feedback loop. That’s why when you see athletes express political views, it [may] feel like they’re stepping out of bounds. That’s not the way the public sees them or wants them to be. They’re only supposed to be an athlete, or they’re only supposed to be this or that. With African-American athletes, there’s basically a sense that they’re just physical bodies, and we don’t want to hear about their thoughts and their minds. TR: Would you say there’s more of a stigma surrounding mental health treatment in black and brown communities than others? TR: How does celebrity affect one’s ability to seek treatment? What about race and masculinity? JR: Race and masculinity is where my interest in professional athletes come into play. It’s a stereotypical, restrictive, rigid form of masculine identity. Often with someone of color, it can be a masculine identity that doesn’t allow for vulnerability. To make a quick connection to Kanye West, he’s a very interesting figure. One of the distinctive things about him is how much of a conflicted figure he seems in a lot of his art. He presents a very complicated picture of [not just] masculinity, [but also] black masculinity in his albums. At times, he embraces [his] vulnerability and pain, [but] not in an ultra-aggressive sort of way. In other parts of his album, there are these hypertrophied, extreme forms of aggressive masculinity that can be misogynistic at times, too. To his credit as an artist, there’s a great mix of the kinds of self-representation he puts out there. Sometimes, the celebrity doesn’t even have to factor in the public’s perception. The celebrity may think, “I cannot be this. I am my public persona. I am that person.” They’re not even stepping back and thinking, “Oh, well, I shouldn’t do this because the public isn’t going to like me if I’m vulnerable.” They might not even admit to themselves how vulnerable they need to be. TR: Would you say then that artists are more resistant to seeking treatment? JR: Yeah, I would. I definitely think if the artist feels “This is my creative source,” there’s an idea that “I have to suffer through this.” Almost like the “pain is my muse and I have to really embrace it.” But not embracing in a way that means accepting their pain and seeking help. I think romanticized notions of depression or mania or panic are not only harmful for the artist, but also the public’s perception. TR: Kanye West is a deeply personal artist who has rapped about his pain whether about depression and considering suicide after the loss of his mother, being on antidepressants, or seeing a psychiatrist. In a recently leaked video, he gave himself a psychoanalysis via the Hopkins Symptoms Checklist. How closely should fans be monitoring their favorites? And at what point does an artist’s work become a cry for help? JR: That’s a very difficult question. I think we’re doing that anyway. This is something that’s cultural. With all forms of media, we’re going to be monitoring them anyway. With artists though, and this comes from my background and clinical work, it is very hard to distinguish what is true self-expression versus what is just a certain persona that the artist has created. In a way, [the things artists do and say] do reflect them, but in some ways, it doesn’t reflect all of them. When it comes to an artist expressing suicidal feelings, it’s really hard to say. I would say this, if I was a personal friend of Kanye West or Jay Z, and I see on the next album they’re mentioning suicide more or mentioning feeling crazy more, I would call and ask if they’re ok. I would do so [not just as a professional], but as a human. TR: Kanye West is known for his bombastic outbursts. How relevant or valid are a person’s rants when they are in such a state of stress? JR: Good question. I’ll speak generally about this. I think when someone is in severe distress—and this can happen not just from depression, but from all sorts of anxiety or personality disorders, or even something more acute like if you’ve suffered from the death of a loved one—it can create a state of mind in which you are not fully aware of, or in control of, what you’re saying and feeling or how you’re behaving. You are, in a way, broken from reality to a certain extent. The complicated part is that celebrities, in my view, are already broken away from reality. [They] don’t have a lot of contact with the public. You have your handler, your manager, etc. Like we were saying with Kanye West, if he’s just around people who just think he’s dramatic—that he’s this, that he’s that—then that’s not a reality check. They’re not interacting with someone outside their circle who’s saying, “Hey, what the heck are you talking about? You look down or you seem anxious, what’s going on?” They’re not getting that type of contact. So it is really hard to tell. When I work with patients, and I talk to them about deep suicidal states they were in and things they were saying in what could have been a deep dysphoric state, they have a limited relationship to what they said. They say, “Oh I said that!” It’s interesting for us to explore some of the things they said and how much they meant it. Just like a dream reflects a bit of a person’s personality, but not in a one-to-one correlation. I think that when someone’s in a very distressed state, the same things can be said. There’s a kernel of what they meant in what they said, but there’s not a one-to-one ratio there. TR: Maybe that means we can safely say Kanye is not a Trump supporter after all. JR: [laughs] Here’s where I’m totally taking my clinical hat off. With celebrities and someone like Kanye, who is very skilled—like Mr. Trump—at manipulating the press, it would be hard to know. Not just now, but even after he receives treatment. I hope he gets help and recovers. When his faculties have been completely restored, he might choose to let the public continue to associate him as a Trump supporter, because of his propensity to provoke. Maybe Kim or someone close to him will know how he really feels, but with his particular celebrity, it is very hard to know what he actually thinks and feels, and if he will feel it the next day. Again, very similar to our president-elect there.